February 6, 2017 | We Learn	| Tips from Denzel B. If you start to find that your nights are beginning to consist of you wrapped up with your dog, watching a sad movie and wishing somebody was there to agree on its sadness (“Why didn’t she just move over?! There was room for Jack! !”), then it may be time to go out and find somebody you can lay with. No not like that, get your minds out the gutter! I meant on the couch while you watch titanic for an epic 9th time. The park. This is pretty much the perfect place for potentially finding love, not only are many dog owners but you can easily get away with looking around and scrutinizing. As far as anybody knows you are just looking for your dog or even at other dogs. Nobody will suspect you are a hapless fiend seeking love…and using your dog as cupid! Social media. For those of you adept with Instagram, you will know that there are scores and scores of pages dedicated to our four-legged friends. Why not follow some of these pages and add some of the people who do so also? You may find that somebody has posted a quirky comment under a picture you also liked and from there you can DM (message) them! #TheLoveGram. This doesn’t just apply to Instagram; Facebook and even LinkedIn could be useful. Dating apps. I’m sure most of you have heard of or used tinder in some way shape or form, you cheeky people! *Wink wink*. But have you heard of Tindog? This is literally as the name suggests, Tinder but for those of us who are so infatuated with our dogs, we would like to use them to find love. Sounds a tad crazy but hey, if it works, it works! 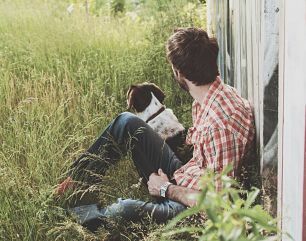 If you enjoyed this post, you should read “How To Help Your Dog Cope With Anxiety” here. Have you ever found love because of your pup? We would love to hear the story-share below!